Woohoo! It’s that time of the year again! Time for another installment of Bloggers United (BU), one of my favorite events ever! I can’t believe this is already the 6th time we’re doing this. For those of you who are unfamiliar with BU, let me fill you in. BU usually happens twice a year, one during the summer and another on December. It’s basically a bloggers bazaar participated by your favorite local bloggers. It’s where most of us sell our pre-loved items and a few new ones here and there. This year, Bloggers United partnered with World Bazaar Festival to bring you a bigger and brighter BU6. World Bazaar Festival is a Christmas charity shopping event running from December 6 to 22 at the World Trade Center in Pasay City. BU6, however, is only a one day pocket event of World Bazaar Festival. I repeat, ONE DAY ONLY. It’s happening this Saturday, December 7, at the 2nd floor of World Trade Center from 10am onwards. Tickets will be sold on site for P50 each for the benefit of ABS-CBN Foundation, Inc.
As usual, I’m sure a lot of you are wondering what I’ll be selling this time around. Although I won’t be able to give you a sneak peek of the items, let’s just say you’re in for a treat! I’ll be selling clothes, shoes (size 5 for my sister and size 7 for me), bags, accessories and gadgets at SUPER LOW prices, just like at the previous BU bazaars. Accessories are priced at P30 to P150; clothes at P60 to P550 (with the exception of formal gowns priced at P1000 – P10,000); shoes at P200 to P1000 (with the exception of a DKNY pair from my sister priced at P2000); bags at P30 to P2500 (only for the high-end ones) and gadgets + gadgets’ accessories priced at P20 – P11,000 (with the exception of an iPhone 5 and Macbook Pro). Sweet deal, right? My ETA (LOL! ETA talaga?) at BU6 will probably be around 3 or 4pm til about 5pm. (Promise!) But if the past BU bazaars have taught us anything, it is that the early bird catches the worm. It’s always best for you guys to go as early as possible if you want to get the best items and deals. Unahan at ubusan ang peg sa BU! Just a friendly reminder though, please make sure to guard your belongings. It can get quite crowded so you don’t want to lose anything! Once you’re at my booth, I request for my dear sweet readers to please be kind and understanding towards my assistants Clariss and Queen who will be manning my booth. Thank you! For more information and updates, follow Bloggers United on Facebook, Twitter and Instagram and World Bazaar Festival on Facebook, Twitter and Instagram. Official hashtag of this event is #BU6. See you there!!! 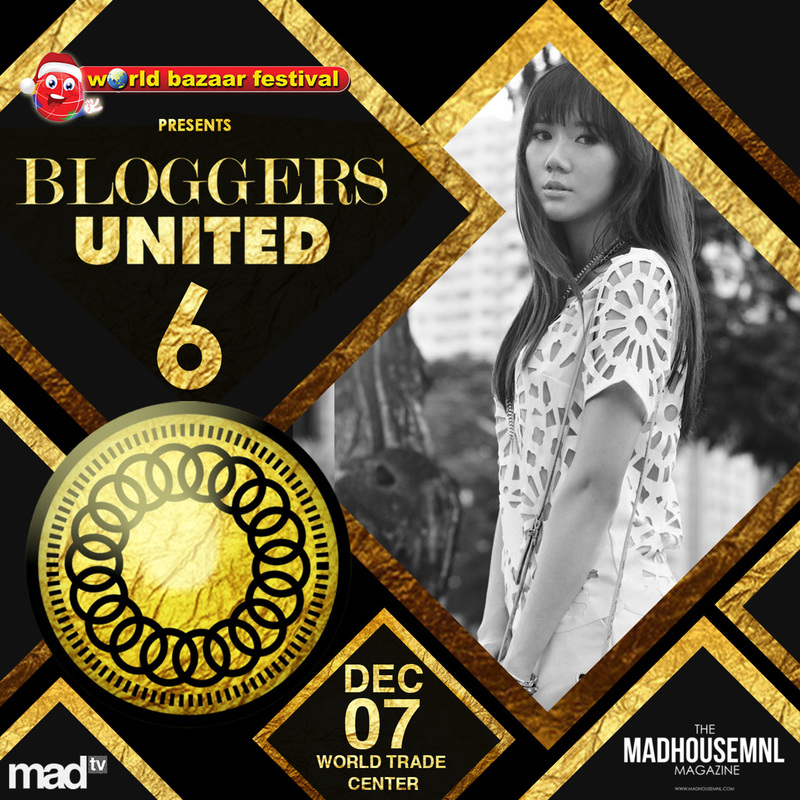 Bloggers United is in partnership with World Bazaar Festival and is co-presented by Paktor, Banana Peel, Contigo, Tomato, Instax, Kotex and NAVA. Special thanks to BU6 major sponsores S&H and Giordano, minor sponsors Fly Shades, YSA, Meister, Nice Day Coffee and Glutamax and media sponsors ETC, Madhouse Manila, Stylebible.ph, Cosmo.ph, FemaleNetwork.com, ABS-CBN Publishing, Inc., Chalk Magazine, MEG, MegaStyle.PH, Metro Magazine, Spot.PH, Status Magazine, TheMall.PH, WheninManila.com. I so envy those girls wo were able to attend the last BU. Due to my tight schedule in the office, I was not able to attend. But for BU7, I will make sure to put it on my Calendar. Do we have a schedule for that yet? I hope to know it in advance. Hi Ms.Camille! First time posting in ur blog. Your one of my inspirations why I also create a blog. (its not about fashion hehe) sonething what’s in and out for me. Its called http://www.pinoyetchetera.blogspot.com sana ma achieve ko yung galing mo in the future. I started blogging last Oct 2013. Hope you can give some advice. Thanks and hope to see you. Definitely!! I’ll wear the shoes next time. Hehe. I wasn’t able to make the bazaar, is the Iphone still available? Wish I could go there. Huhuhu. Kung pwede lang magteleport galing Cebu! and i hope u can have this bazaar here at Cebu someday.. i would absolutely be attending ..
Oh my goodness!! Very wrong timing naman nung film showing huhuhuhu i need, not want, to come!! Next year! It’s a date! Can’t wait to get my hands on your sister’s size 5 shoes, your accessories at kung carry ng budget 2 dresses pa.
Aaaaaaand it’s the 6th time that I’m so bummed living here in Bacolod City. Can’t-go-to-BU6-boo-hoo. Ate Camille!!! Thanks for featuring me at your IG sa Meet and Greet mo sa TriNoma. Then~~~ I’ll attend this too! Hope to see you again!!! Ohhhh! BU newbie!! :) I hope you enjoy and that this won’t be your last BU! More BUs for you! Oh my gosh! I’m so excited for tomorrow! Di na ako makatulog mamaya siguro. Hehe. I have a budget kasi of P5,300 (yan lang kasi ang savings ko) haha! Ano yung gadgets na binebenta mo na nasa 5k-11k ang price range? I so wanna cry right nooow! I have work ’till 4pm tomorrow! I NEED to get some of your shoooes! T-T I just love them! Wahhhhh yey!!! I still have classes until 2, good thing you’ll come around that time too hehehehe see you ms.camille!! Where is your booth located? BU organizers didn’t produce any map this time unlike in BU5 :( I’m really really excited!!!! Waaaaaa I can’t wait!!!! Hope to catch you tom!